Today we (Sitka campus faculty and staff) met to discuss Tony Wagner’s book “Creating Innovators” our first book club meeting. We had a great discussion talking about the different ways that faculty and parents can create experiences that foster creativity and lead to innovation. Prior to our meeting, Nicole shared an article on Technological, Pedagogical and Content Knowledge, by Mark Anderson. 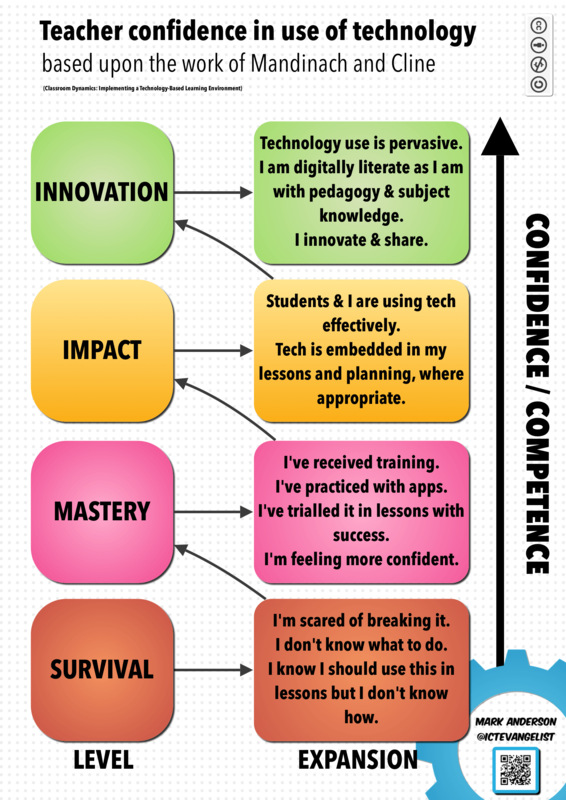 In this article he quotes Koehler and Mishra, 2009, stating that “educators should be able to recognize when information technology can assist or impede the achievement of a goal.” Then he provides an interesting chart with the ultimate degree of confidence and competence being– you guessed it– INNOVATION! We thought this would be a great opportunity to link our book club ideas and our Title III goals– helping faculty become more competent and confident in their knowledge and use of instructional technologies. If you are feeling like you are at the “survival” level, please contact us for help! We can assist one-on-one, or online, or set up something that feels right and works for you. If you have mastered technologies, but don’t feel like you are getting the impact with students or the results that you were hoping for, please call and let’s talk about ways that we can enhance or improve the impact of your strategies in your courses. Lastly, if you are using technology in interesting, successful and innovative ways– please share with us some of the things that you are doing. We love hearing your success stories! Guys. Thanks for this. So rewarding to know people read what I write. Keep me posted on how you’re getting on. I’d love to hear more! Best wishes. Mark Anderson.